The PiGRRL Zero Advance is a design that has been over a year in the making, ever since my modifications to the original Adafruit PiGRRL Zero project in the creation of the Plus version, this design incorporates all of the ideas, suggestions and modifications that I and several others have come up with in the last couple years. I'm hoping it will be one of the easiest/most comprehensive designs in the DIY space right now. Lower the entry level for a DIY project and making it even easier to start and build. Cut down the build time, and reduce the chances for error during fabrication. Incorporate all the design suggestions and ideas that have been made since the first project. Make the design slimmer, cleaner and just generally look more professional. The bar has been raised in screen real estate. 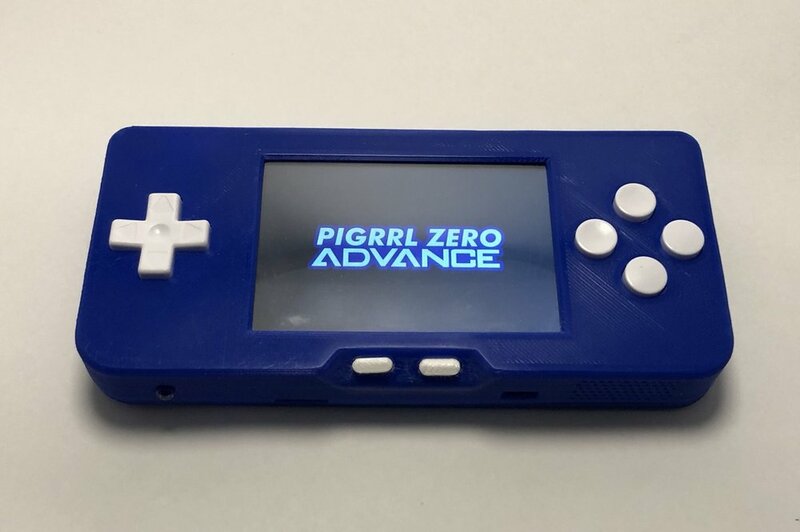 The original Adafruit PiGRRL Zero was a 2.2" screen, my original Plus design went to a 3.2" screen and this new design has a 3.5" screen. The screen is direct from Adafruit, so you know it's going to be a quality product. 3.5" PiTFT screens however were well known to be a problem with Retropie that was solved thanks to juj for FBCP-ili9341! This was a huge goal for the project and mission accomplished! I was effectively able to reduce the case size down from 1.07" to approximately 0.80" thin. This is approximately a 25% reduction in the case size changing this design from a hobbyist project to a legitmate device to throw in your back pocket or backpack. The original project had a speaker but ever since I added audio, I always wanted a headphone jack. Adafruit recently released a I2S Stereo Decoder that allowed the addition of a headphone jack to the project! Also included is a mini-HDMI out connection which allows you to put all of your gaming up on the big screen! 3D printed buttons are fun but actual molded buttons used in the original controllers brings back that sense of nostalgia and frankly provides a much better gaming experience. These buttons work best from an original SNES or Famicon controller, but modern molded buttons will work as well. Some of the biggest hurdles to this design was getting the 3.5" screen to work with Retropie with stutter or tearing. Also included some custom coding to allow for a low battery icon to show up on the screen, as well as many other minor adjustments that make the image provided the best and easiest way to get your build going. Obviously I'm here for the hobby and fun of building these projects so you're on your own for game files or anything beyond the Retropie build. Tons of details were thought through on this design. How about a toggle for the power button? Got that. LED low battery indicator/charging indicator? Yep. Threaded inserts for the case so you can open and close repeatedly without damage? Included that too. Custom designed bumpers to emulate the original SNES controller? Yes sir. There are several other minor details when creating this from scratch, its hard to go through them all here.